He’s been appearing nightly in Murray at the Tropicana Las Vegas’s Laugh Factory since April. 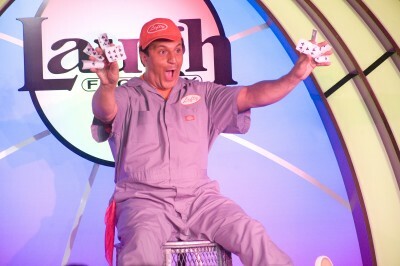 Starring comedian-magician Murray SawChuck, the show also features Leferovich’s “Lefty”—a bumbling stagehand with hidden magic talents and dreams of stardom. When did you get into magic? Was it something you started as a kid? My father John Leferovich Jr. W’53 was a lawyer in New York City and he was very busy working. My mother said, ‘You should do something fun with your two sons on the weekends.’ My dad had always been fascinated with magic—I often joke that magic and being a lawyer are kind of the same thing: trickery, deceit—so it’s something we started doing as a family hobby. It wasn’t something at 4, 5, or 6 years old I was doing as a career. It was just something fun to do with our dad. But over time word spread. I think I was 7 when we did our first show. My dad had a very interesting philosophy which worked for many years. Since I was 7 and my brother was 9, there were times we’d be doing shows for kids who were the same ages we were, so my dad would always start the show to give it that authoritative figure. I kept doing it all throughout elementary school and high school. As my friends had paper routes or would bag groceries to make money, I would do two or three magic shows a weekend. Tell me about your character Lefty in the Tropicana show. For the first half of the show, you think I’m just a stagehand. Even though I do some funny comedy bits with Murray, you don’t know that I’m also a magician. When I start doing manipulations with playing cards, people are even more stunned than usual because they can’t believe that the stagehand is doing this amazing magic. And you do it all without speaking. Right, I don’t speak. You can do a lot without speaking. The music I perform to and the facial expressions I give are so vivid and so clear that some people don’t even realize I’m not speaking. From the videos, it looks like you’re primarily doing slight-of-hand magic. I’ve been to magic shows where I see people leave and instead of being happy, they’re frustrated because they can’t figure out how the magic was possible. My character is very happy-go-lucky, and there are times when the magic almost seems to happen to me. When the card appears, I’m just as shocked as the audience is, so the audience is on my side. I don’t present it as Ta-da, I fooled you. I present it as I can’t believe the card appeared either. So you’d rather entertain people than confound them. I think laughter is real. When I get a laugh on stage, I know it’s real because you’re not forced to do it. Clapping isn’t a natural reaction. It’s something, over time, you’ve learned. With laughter, you’re not thinking about it. You don’t go, ‘That was funny, now let me laugh.’ To me, getting a laugh is a real and raw emotion. I’m curious to hear your thoughts on the status of magic today. How has it changed from when you first started? I think magic has become a bit more current and a bit more hip. A lot of that has been David Copperfield and then Criss Angel. For a while, the tuxedo stuck as the classic magician look. Now, I think magic is turning a corner and becoming more modern. The look of it is assimilating to what our culture is producing, as opposed to just staying in that old period. Definitely David Copperfield. My magician friends and I would wait around for his big TV special every year. I also admired people outside of magic. Growing up, I was a huge Michael Jackson fan. I thought he was an incredible entertainer. I was lucky enough to perform for him at Neverland Ranch in 1999, which was an unbelievable highlight of my career. How did you wind up performing for Michael Jackson? My friend [Franz Harary] was doing a magic show that he’d performed a couple times for Michael Jackson. He asked if I wanted to come out and perform, too. I flew in from the East Coast, and it was just a wonderful experience. I got to meet somebody who was, for a while, the biggest star on the planet, and I got meet him in the most real and relaxed environment possible. He was wearing a baseball hat, a button-down shirt and jeans.